Over the past couple of years I have found myself sailing less as my limited leisure time has been taken up by other interests. The result of this is that Bluster languished under her tarp, unused and unappreciated. Last fall I made the tough decision to sell Bluster. In March I posted her on the classified ads of the Small Craft Adviser magazine and the Port Townsend Pocket Yachter web site. I had numerous inquiries. Todd from Portland was particularly interested and after some email information exchanges we agreed on a price and pick up date. Todd has an interest in small wooden boats and was quite familiar with the Chebacco. He sounded like a handy guy and keen on the maintenance and modifications that goes with this sort of project boat. He has a young family and he envisions fun times on the water with them. Todd reminded me a little of the younger me. He picked her up on April 15th. I am thrilled to think that Bluster is off to a new second life with Todd and his family! Whilst sailing this past weekend I made the unpleasant discovery that the centreboard refused to be lowered. In the thirteen years since Bluster was launched I have never experienced this. No amount of poking or wiggling from about could convince it to cooperate. Back on the trailer I took a look and could see a couple of cm of the trailing edge of the centreboard protruding – normal it would be tucked up inside the case out of sight. Centreboard peeking out with no visible means of holding it up. This looks like this is a job to be tackled from below. There is a surprising amount of information on the Internet pertaining to jammed centreboards and how to approach the problem. When inserting the centreboard during the build I was fortunate to have at my disposal a couple of air hoists and slings which made this a pretty easy operation. Without access to a lift I will apply some creative thinking to this. It has been one full year since Bluster has been in the water. With work, family and home commitments as well as my other activities this just did not happen. Adding to my frustration was the fact that I was not getting to the maintenance and cleanup activities which I enjoy. Some years are like that. Moving forward I was happy to have a nice clear extra-long BC Day long weekend to do some boating. Launched Bluster nice and early at the Gibsons Landing ramp and also secured a slip for two nights in the marina there. It was already becoming a hot day when I touched down at the Granthams Landing public dock to pick up Lisa and Farley. We spent the morning and afternoon sailing and motoring around the southern bays of Gambier Island. After a long downwind run we turned to tack back upwind when I discovered my centreboard jammed in the case. We were still able to tack but not as high nor come about as smartly as we should. I noticed last year that my reliable Honda 5 hp outboard was have trouble with slow speed and idling and this did not by some miraculous means resolve itself over the winter. It is OK if I run keep the revs a little higher at slow speeds but think it is time to pull and clean the carburetor. Well sun baked and satisfied at the end of the day we motored back to the marina. With the engine troubles requiring higher revs it felt like we were entering the marina and little fast so just at the breakwater I throttled down just a hair and (naturally) the engine died. I was thankful for cork-like Chebacco design and my quick thinking, skillfully wielded boat hook crew fending us off the barnacles until I restarted. Without further ado we found our slip and secured the ship for the night. The next morning we headed out early to avoid the heat of the day on glass like seas for a three hour motor cruise around Shoal Channel. Back to the slip for Bluster and on to our activities ashore. Early the next morning haul out and back to the storage lot. I like to avoid the launch ramps at peak times and with my current tow vehicle I aim for a high tide retrieval. One of the many wonderful design features of a Chebacco is the generous cockpit. Some 20 foot sailboats sacrifice cockpit for cabin space but it has been my experience (with my style of sailing) that vastly more time is spent in the cockpit than below. That said there are times when a little more covered living space would be nice. I did a little research on cockpit covers and found these can range from a basic blue tarp draped over the boom to complex Sunbrella and tube frame structures. Before spending money on expensive materials I decided to make an inexpensive mock up using white polytarp and white duct tape. Using the boom as a ridge pole I made measurements every foot in length from the boom to outside the coaming. The resulting shape is sort of a tapered rectangle. I transposed the shape to the white tarp and cut it out after adding a bit for the edge seams. All edges were finished with white duct tape and some left over brass grommets were hammered in. After a couple of trials would say the cover works as well as could be expected. Not a lot of head room but a life saver for sitting out a hot and sunny day at anchor. A definite improvement over a basic tarp which is too square to fit properly over the tapered rectangle shape required. Total cost was under $20. This past BC Day holiday weekend was a real stunner. A solid high pressure front brought a forecast of nothing but sun and warm temperatures for the next week. Curtis posted his availability for the weekend and wondering if anyone else was interested in getting together for a little impromptu mini cruise of southern Howe Sound. Murat and I both jumped aboard. Bluster spent the Friday night in a berth at the Gibsons Marina after a day of sailing with Lisa and Farley. On Saturday I motored clear of the breakwater and hoisted the mainsail for a splendid run down Shoal Channel and reach across the south shore of Gambier Island to Halkett Bay on its eastern tip - hitting 5.5 knots on the GPS at times. 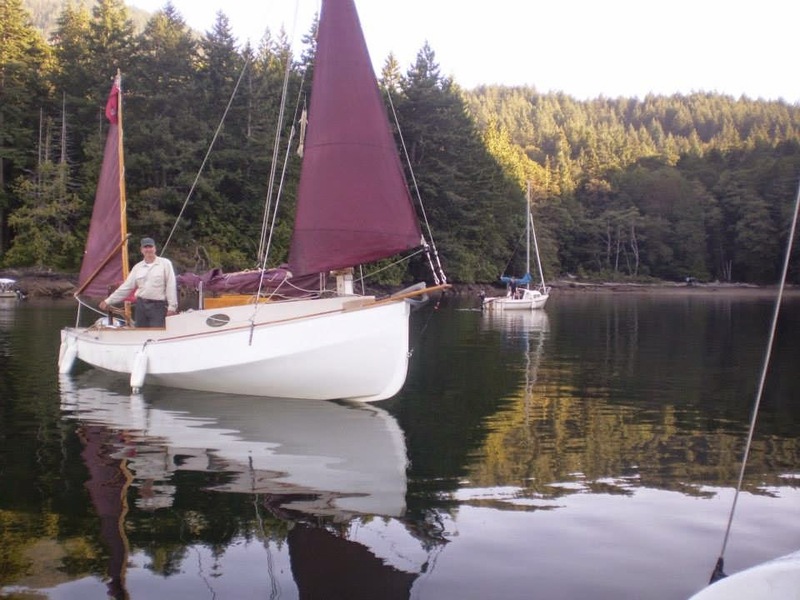 Conditions were so enjoyable that I stayed out sailing between Gambier and Bowen Island until 5:00 pm when I dropped the main and sailed into the bay on jib alone. This was a first for me to manoeuvre through an anchorage and drop anchor under sail alone. I set about tidying up and relaxing before Curtis and Murat arrived in their matching 16’ Sirens after sailing up from Vancouver. We rafted up and set about making dinner after which we applied our collective innovation skills to help Murat with his jammed jib furler. Curtis had a second ‘hank on’ style jib along so Murat removed his jib/furler. The jib halyard was pulled through the upper block so we performed a daring at sea lowering of the mast to rethread the pulley. By dark Murat was back in business. We separated to anchor individually for the warm and beautifully starlit night. The bay was mirror calm in the morning and Curtis gave us a demonstration of his Yuloh (Chinese sculling oar) skill. Once the fleet assembled we motored out of the bay and tacked our way westward for the next couple of hours until becalmed just off Langdale. Lots of fun for me to sailing in company for a change. I had commitments ashore so I then headed back to the ramp at Gibsons Landing while Curtis and Murat poked around further before ending up at the Plumper Coves Marine Park dock where they spent the night before sailing back to Vancouver on Monday. Small boats – big adventures. Thanks guys for a great weekend! After years of being a strictly cat household and after much reflection and research my wife located and adopted a rescue dog. He is a terrier sort of mix and he has quickly become a much loved family member. We renamed him Farley as he arrived in our household the day the iconic Canadian author Farley Mowat passed away. He is always happy and but happiest when with Lisa whom Farley adores. We bought him a Farley sized PFD and took him for a short day cruise around Shoal Channel this past weekend and he passed the crewman test aside from sleeping while on duty. Sailing has taken a bit of a back seat to other activities and commitments this year so it was not until the recent August holiday weekend when we finally got onto the water. For the past two years I have been storing Bluster in a commercial storage lot in town. Although not ideal (which would be a free, enclosed, pull through building on my own property) this storage arrangement has worked out OK. The lot is well managed and secure. Over the year I stop by regularly to check the tarp, tires, etc. On the last check I noticed a small bee’s nest attached to the lowered mast just over the motor well. It looked empty at the time so when I arrived to remove the tarp and hitch up the trailer I would use extra care. As I lifted the forward tarp I was confronted with a very active softball sized nest attached to underside of the in the area of the tabernacle. This was getting out of my league so I made a call to the local exterminator and within thirty minutes he arrived on site. The ‘forward’ colony he identified as the relatively docile umbrella wasps and the ‘aft’ colony as the aggressive yellow jacket wasps. He suited up in his bee keeper’s outfit and proceeded with extermination. In the end he found four umbrella and one yellow jacket nests. After this minor setback we are off to the ramp! I live on the often wet and often wild west coast of Canada. Alone or with family or friends I enjoy a variety of outdoors activities both near and far.